This clock is housed in a long case veneered with ebony on oak. The lift-up hood is glazed on three sides. At the corners it has attached Corinthian columns with gilt-bronze bases and capitals. They support a pediment with a gilt-bronze cartouche and laurel swags. The acorn finials beneath the front columns on the hood suggest that the clock was originally designed to be hung on a wall, but was later adapted as a long-case clock. The present pendulum is only 7 inches long. There were three clockmakers with the name of Ahasuerus Fromanteel working in London from 1630 onwards. This is probably the work of the second, who became a Freeman of the Clockmakers' Company in 1655. His family were of Flemish origin and had settled in East Anglia in the 16th century. Ahasuerus Fromanteel introduced the use of the pendulum for clockwork to Britain. He learned of the development through his son John, who worked for eight months in 1657-1658 with the clockmaker Salomon Coster in The Hague. Coster had obtained the rights for the pendulum from Huygens. 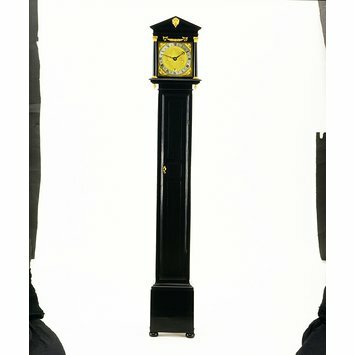 This clock is housed in a long case veneered with ebony on oak. The lift-up hood is glazed on three sides. At the corners it has attached Corinthian columns with gilt-bronze bases and capitals. They support a pediment with a gilt-bronze cartouche and laurel swags. The acorn finials beneath the front columns on the hood suggest that the clock was originally designed to be hung on a wall, but was later adapted as a long-case clock. The present pendulum is only 7 inches long. One key. Condition: the cartouche described as a modern replica on file note. June 1972: Mr Gildersleve treated the clock - cleaned; general overhaul. Striking fly repaired, crown wheel pivot repolished, strike lifting lever repaired. 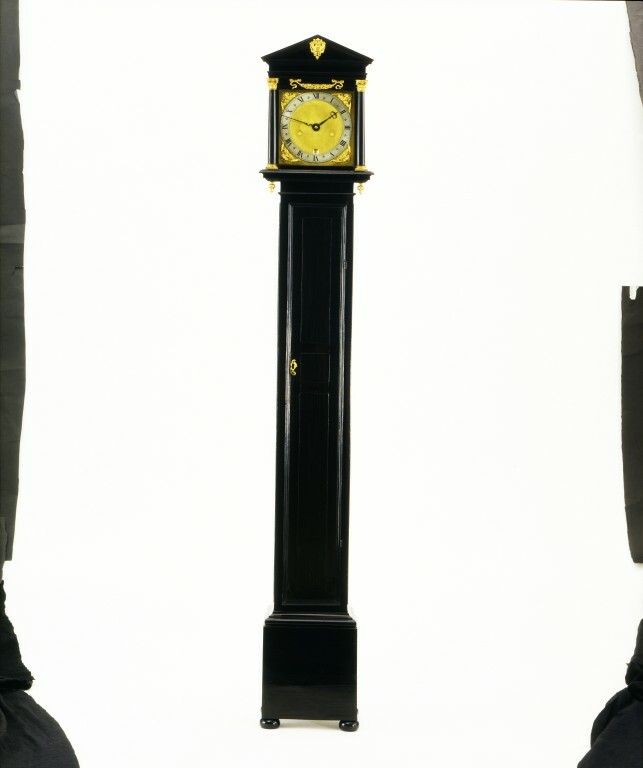 Refers to this "not too undesirable bequest…an early Fromanteel clock showing the first development of the long case clock"
reports "this type of clock exists in such small numbers that this acquisition…(is) one of importance". The clock had passed through his hands ten years earlier and he recalls certain repairs & replacements and some details of provenance. He agrees with the possibility of its having started out as a hanging clock. This letter appears to be a response to an enquiry but no such enquiry is on file in the R.P. "It must be ten years ago since the clock passed through my hands and I must come and see it some time to refresh my memory. I do recall that the verge escapement was replaced and the hole in the dial where a sunk seconds -Indicator had been cut was filled in and matted over. A very difficult job but very well executed by Danial Parkes. The inverted finials under the hood were replaced, some other mounts and the plinth added. This plinth was, of course, a mistake and it should have bun feet. The clock belonged to an old Jersey family who moved to South Africa. When they arrived in South Africa they disliked the country and sold up everything except the clock. They returned to Jersey bringing the clock with them and having arrived they then put it in a sale. A curious thing to have done after taking the bother of bringing it back, but this enabled me to buy it. I agree the possibility of its having started life as a hanging clock, but contemporarily altered. I would say that the escutcheon is correct and of a design used by the Fromanteels." In October and November 1658 an advertisement appeared in the Mercurius Politicus and the Commonwealth Mercury (both published in London) which read,' There is lately a way found out for making Clocks that go exact and keep equaller time than any now made without this Regulater (examined and proved before his Highness the Lord Protector, by such Doctors whose knowledge and learning is without exception) and are not subject to alter by change of weather, as others are, and may be made to go a week, or a moneth, or a year, with once winding up, as well as those that are wound up every day, and keep time well; and is very excellent for all House Clocks that go either with Springs or Waights; And also Steeple Clocks that are most subject to differ by change of weather. Made by Ahasuerus Fromanteel, who made the first that were in ENGLAND. You may have them at his house, on the Bank-side in MOSSES-ALLEY, SOUTHWARK, and at the sign of the Maremaid in LOTHBURY, near BARTHOLOMEW LANE end LONDON'.